CAHWT protesting in PWC's lobby this afternoon. 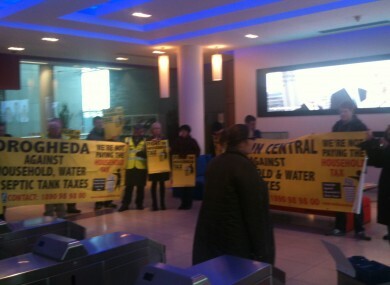 UP TO 30 activists from the Campaign Against the Household and Water Taxes occupied the lobby of Price Waterhouse Coopers in the IFSC, Dublin this afternoon. They then made their way to the Convention Centre, where IBEC are holding their conference, to continue their protest. PWC were the Government’s advisers and we want to make that link because no financial institution has been targeted. Ordinary people are suffering because of the advice PWC gave and it’s the same ordinary people that are paying the banks back, while PWC makes a lot of money. Perry said that this was only the beginning of a campaign targeting financial institutions, but said the likes of the councils and the Office of the Revenue Commissioners would be next, “but I can’t say when and where else because that is the nature of the protests”. Email “30 protesters occupy PWC over ‘unfair’ austerity taxes”. Feedback on “30 protesters occupy PWC over ‘unfair’ austerity taxes”.